Chicago is the third-most populated city in the US. It is located on the shores of Lake Michigan, and thanks to many green parks and gardens it is called City in a Garden. It was created on the swampy and inhospitable shores of the lake, but thanks to its strategic location, it soon became a major trading venue for all those who wanted to get their industrial or agricultural products to the east. 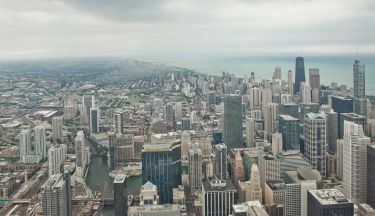 The Windy City (second nickname of Chicago) will blow you away with its stunning architecture and many cultural and sport events (if you're football or baseball fan you will love it). View more than 50 great pictures of Chicago including GPS, offline maps and useful travel and photo tips. Currently lives and woks in Belgium, but New York City has become her passion. During her sabbatical year she thus decided to follow photography school there. She regularly returns to New York to continue her long-term project of documenting the life in her favorite city. Her preferred photographic objects are bridges and building facades as they offer numerous hidden patterns and structures. In her photographs she tries to find harmony and beauty in everyday objects and situations which are not always evident at the first sight. The search for harmony helps her to face the everyday, sometimes rather monotonous, working life. Full version of the guide includes 38 additional photos.